Hello, we set up two different auto responder emails to go out after someone pays and registers for courses. The emails used to send them out a copy of the courses they registered for. However, recently they have been sending our the recipients a bunch of gibberish nonsense. Below is an example of what has recently been going out. We need this fixed ASAP, I am not sure what happened. Below is a copy of your receipt, please keep this for your records. CANCELLATION POLICY: Daystar does not give cash refunds for cancellations. If Daystar has to postpone or cancel a course we will gladly refund your money. Below is an example of what USED to be sent out before a bunch of gibberish happened. CANCELLATION POLICY: Daystar does not give cash refunds for cancellations. Students that cancel with two weeks or more notice will get a full credit refunded to their Daystar account. A $50 fee will be charged and deducted from the credit balance for students who cancel with less then TWO weeks notice or do not show up for class. Account credits for future workshops are good for one year. I have cloned your JotForm and see that the autoresponder email is having only three fields. As I tried to submit the cloned form, I have received the auto-responder normally. Are you checking the email on any email client like MS-Outlook, etc? If so, could you check if the email is displaying normally when logged in to the web version of your email? 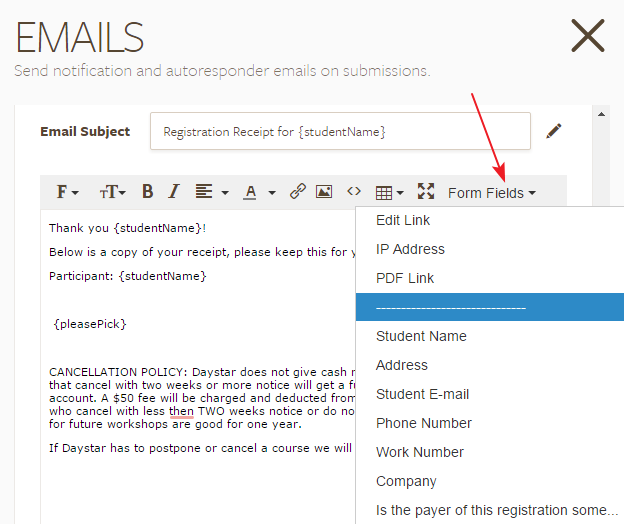 Also, you may add the other fields from the Form fields dropdown to the email. You may also consider adding a new autoresponder so that the fields will be added automatically in a table format and you may add the additional content to the email as necessary. I do not get this auto responder email, the customers who sign up and pay for our courses get this email and many of them have emailed me because they are recieving gibberish. It worked perfectly fine until about 2-3 weeks ago. I understand. As I check the form revision history, it seems that there are some modifications made to the form recently which migh have caused the issue. Please make the changes mentioned in my earlier post so that the auto-responder should be working fine. Also, please try submitting a test submission so that you can see how the auto-responder is displayed. What changes are you talking about, and who created these changes because it was not us! As I said these auto responders have not been working properly since about 2-3 weeks ago. Are people at Jotform going into my forms and making changes without my permission?? Please be noted that we do not make any changes to the form unless requested by the user or do not login to user's accounts other than administrative purposes when certain issues are raised. As I check your account, I see that there are some changes being displayed with product modified. Is the login of your account shared with anyone else? Please make sure that you are logging out from the JotForm account before you are going away from your PC. You may check the changes made from the form revision history or login or form modification history from the account history page. Since the emails are not being displayed correctly now, please make the changes to the auto-responder so that the users should be able to receive the emails correctly.